I suppose the trickiest part of creating a show like Once Upon A Time is deciding what to include because of the sheer amount of possibilities. There are so many myths, legends and Disney products out there that I dread to think what it must be like deciding what does and doesn't go into the show's mythology. 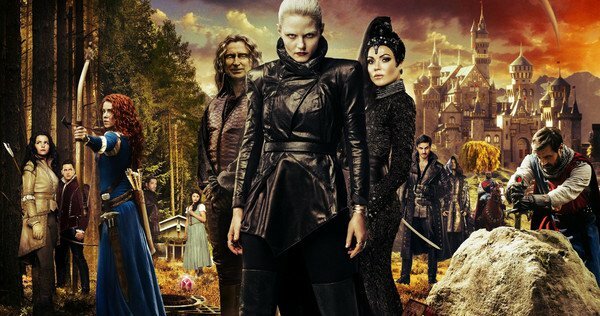 OUAT often succeeds at weaving the different threads together and giving all the characters some interesting interactions and storylines. This is something that season five of OUAT manages to do, incorporating Camelot, The Underworld and even Jekyll and Hyde into the proceedings. But it also hits some roadblocks. And that is sadly what will ultimately let this season down. The first big issue is the use of half-season long narratives. These have been a big issue for this series since season 3 but unlike previous seasons, it was nice to see Camelot and The Underworld and the main cast remained on good form throughout, not looking as bored as they all did travelling through Neverland! It was Emma and her struggles as the Dark Swan and her love for Hook and her family which took centre stage throughout the entire season, regardless of whatever was going on. Regina also continued to adapt to being a force for good as she tries to find her happiness. Rumpelstiltskin was still Rumpelstiltskin, up to some nefarious activity or another. These three characters were given plenty of scope to evolve and never got lost in the tide of new characters including Merida, Merlin and Hades. Another issue was how the themes were pulled and pushed for far too long. I'm sorry, but we certainly didn't need nine episodes in the Underworld, especially when you take into consideration how rough and unpolished the CGI was. And the same applies for Camelot. Keeping the stories in one location like these will eventually make the plot twists feel forced as a way of keeping the characters wherever they are. It really feels like the settings now drive the drama rather than the characters. Something else which this season also suffered from was repetition. Some question can be and are worth asking over and over again because the answers can be explored in a multitude of different ways. Good and evil is always going to be a thing, it is certain a topic which can be mined time after time. And that is always going to be true for a show which looks at fairy tales. But when this season came to specifics, they covered the same ground with tiring effect, the most striking of these being the return of Cora. While it was nice to see Barbara Hershey return, Cora's story was over and done with, wrapped up quite nicely back in season 2. But here she is, being brought back into the fray to re-tread similar problems and conversations again. And as good it was to see Merida from Brave appear, her storyline was so obviously shoehorned in that it practically broke the fourth wall, whereas the introduction of Dr. Jekyll and Mr Hyde was done much more subtly and it played nicely into Regina's conflict. The end of the season blended into a smooth cliff-hanger for season six to pick up, something that OUAT hasn't done for quite some time. Easily one of the most intriguing aspects of this season was the exploration of the Dark One. The power and significance that comes with the Dark One is something which has been a key part of the show since the first season. We've seen it turn Rumpelstiltskin from a coward into a very powerful being. And we have seen him demonstrate how dark that magic is and the emotional consequences that comes with it through the eyes of Baelfire and Belle. It certainly was interesting to see someone else burdened with its power now we've seen what it did to Rumpelstiltskin, someone who didn't ask for the burden. But the power of the Dark One went beyond Emma. With the introduction of Nimue, we got an origin for the Dark One magic. It was a corner of the show's mythology which needed a light shone on it and by diving straight into Dark One 101, we get a real insight into why it is so hard for Rumpelstiltskin to give up its powers. Despite the slightly uneven storytelling when Hook became the Dark One, we now have been able to see what is behind Rumple's choices and it helped to make him a much more compelling character. As I mentioned above, there is a great deal of time spent on Emma's love for Hook. They really haven't been able to be a proper couple yet and while I know that date nights in Storybrooke aren't going to be a thing now with Hyde on the prowl but I do hope we get to see them have some happiness instead of the pair being constantly in panic mode. They sure as hell have earned a break. And to be honest, so have we. And then there is Regina. She is undoubtedly the break out of the character of the series with actress, Lana Parrilla constantly being given demanding content and always delivering. I haven't seen season 6, which still hasn't finished in the States but having Regina and The Evil Queen running around as separate characters was a really brilliant move. But her character still has a long way to go yet. Season 4 saw her turn full hero and the past 23 episodes, saw her trying to keep that up and trying to open herself up to more people than just Henry. She shares some surprisingly moving scenes with not only Emma but Snow too. And what is really brilliant is that while Regina has managed to find her heart, she has still remained blatantly honest and practical. And that felt really refreshing.